Successfully Added Huawei Mate 9 Android Smartphone - Android 7.0, 5.9-Inch Display, Octa-Core CPU, 4GB RAM, Leica Camera, OTG, Fingerprint, 4G to your Shopping Cart. The Huawei Mate 9 is the latest Android phone launched my China’s largest and most trusted smartphone producer. With the launch of this flagship smartphone, Huawei has introduced us to a smartphone that truly tops the ranks of the smartphone industry. Packing the latest hardware, absolutely stunning cameras, and running on an Android 7.0 operating system – this Chinese smartphone truly gives us a peek at what the future of the mobile industry looks like. Packing a beautiful 5.9-Inch display this phablet brings along a stunning visual experience. Featuring the latest IPS technology, you will be able to enjoy an ultra-wide viewing angle and vivid color on this beautiful smartphone. With its 373ppi pixel density and portraying 16m colors, this 6-Inch smartphone truly brings along a cinematic experience that can be enjoyed effortlessly from the palm of your hand. Further enhancing your visual experience is the phone’s Mali-G71 MP8s GPU that allows you to enjoy FHD movies and the most graphically demanding games. With this Android phone at hand, you can be assured that not a single moment of boredom will lay ahead ever again. Running on the latest Android Operating system, Android 7.0, the Huawei Mate 9 comes packed not only with the great and familiar features of Android 6.0; but also with tons of new options that are guaranteed to deliver you an absolutely astonishing user experience. Along with its Octa-Core CPU that has been clocked at 2.4GHz and 4GB of RAM, this Chinese smartphone will deliver a smooth performance that is capable of dealing with the most demanding of tasks and intensive multitasking sessions without dropping a frame. Whether you like to play games, browse the web, watch FHD movies, or simply use multiple of your favorite applications at the same time – nothing will slow down this 6-Inch smartphone from Huawei. With 64GB of internal storage and the option of sliding in a 256GB micro SD card, you can be assured that the Huawei Mate 9 always has some storage available for you to keep your favorite media and files alike. Featuring an absolutely incredible 20MP dual-lens rear camera, this latest Android phone allows you to take mobile photography to entirely new heights. Supporting an abundance of photography modes and customization options, this camera is fit even for the most professional photographers out there. Shoot stunning images and record breathtaking video at 2160p, with this camera at hand you can be assured that not a single special moment in life passes by uncaptured. Additionally, the Huawei Mate 9 also features a sophisticated 8MP front snapper, allowing you to engage in high-quality video calls or shoot the perfect selfie while out with your best friends. Browsing the web has never been easier as this Android phone supports both 4G connectivity and Dual-Band Wi-Fi. Enjoy the fastest data speeds out there no matter where you are, with the Mate 9 you’ll always be able to stream movies, browse the web, and engage in long distance video calls at any time of the day. Packing a whopping 4000mAh battery, this cell phone will provide you with numerous hours to browse the web or to simply enjoy its own features without you ever having to worry about running out of juice. The Huawei Mate 9 comes with a 12 months warranty, brought to you by the leader in Android phones as well as wholesale electronic gadgets.. Excellent phone for this price! Shipping was very fast especially for international. Phone was brand new and completely worth it considering it will retail for 700-900 in the US when it comes out. 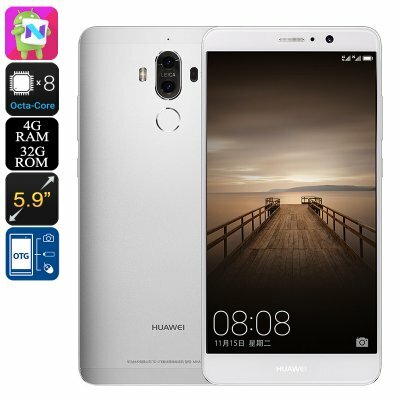 Excellent smartphone chinois qui a un excellent rapport qualité prix. Système très fluide et facile à utiliser.